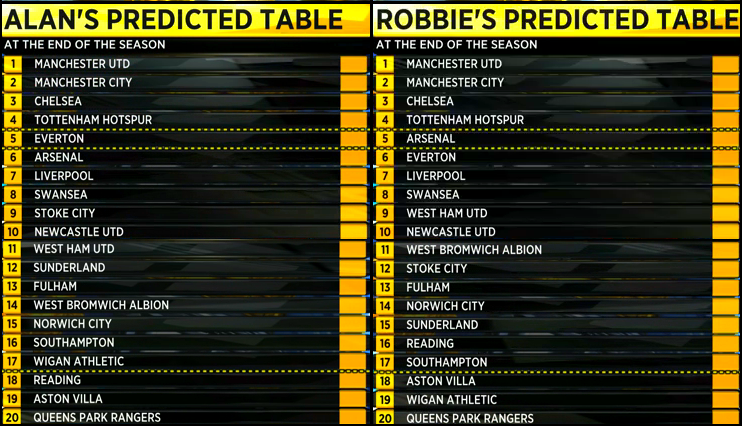 This is how BBC Sport pundits Alan Shearer & Robbie Savage think the English Premier League would finish up this season. Mouth-watering. Clash of the Titans. Return of Cristiano Ronaldo. Sir Alex vs. Jose Mourinho. These were some of the multitude of exclamations that were uttered when the draw for the Knockout Stages of UEFA Champions League 2012/13 was revealed earlier today. Other tantalizing fixtures include Arsenal taking on Bayern Munich, Barcelona tussling with AC Milan and Juventus getting to battle Celtic. But those pale in comparison to the battle of the big two in club football! One has to hark back to the 2002/03 season for United & Madrid’s last meeting at the European stage – Madrid running out eventual winners by 6-5. The stakes are much higher this time around. With their La Liga defense looking all but over, what with a 13 point deficit to Barcelona, and talks of Mourinho heading for the Bernabeu exit, the CL remains Madrid’s top priority. For Sir Alex, another European triumph might only be second on his to-do list after wresting back the EPL crown from City but that doesn’t make it less wanted. Especially after those defeats to Barcelona and their disappointing campaign last season in the CL. As I said in my post about the group stages’ draw – once gain, Le Jeu Commence! Holders Chelsea are grouped alongside Juventus whereas Arsenal have Schalke & Montpellier for company. Manchester United have an easy looking draw with Galatasaray, CFR Cluj & Braga being their opponents; but we all know what happened last season with a similar “easy looking” draw! The toughest group has to be Group D with Real Madrid, Ajax, Borussia Dortmund in there…and yeah, Manchester City round off that group…all four champions of their respective leagues! The first legs of the round robin matches start on the 18th of September and the group stage will complete on the 5th of December. Le jeu commence. The draw for the 2012 UEFA Champions League was held earlier today and as usual, one of two interesting ties were thrown out. Holders Barcelona would take on Serie A champions AC Milan whilst the lone remaining English side Chelsea were handed a trip to Portugal against Benfica. Real Madrid were handed an easy match against Cypriot side APOEL, whose fairytale run in this season’s tournaments continues. Bayern Munich take on French side Marseille in the remaining QF. First legs of the matches are on the 27th/28th of March with the return legs on 7th/8th of April. The Semi Finals’ first legs are scheduled for 17th/18th of April and return legs on 24th/25th of April. Final is on the 19th of May at Bayern’s Allianz Arena.